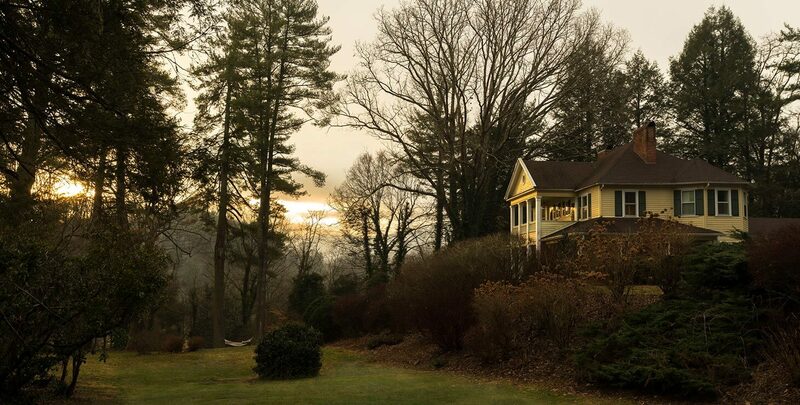 The carefree Carolina Mountains are home to our three Pond House Suites at the Yellow House Bed and Breakfast here in Western North Carolina. Two of these suites are dog-friendly and the other suite has room for several guests. We offer two pet-friendly suites both of which have easy outdoor access. We encourage you (and your pet) to enjoy our expansive lawn, pond, and beautiful wooded surroundings with mountain views. During the warmer months, there are several dog-friendly restaurants in the greater Waynesville area that we recommend. The first-floor, pet-friendly Kinsale Suite features a king-size sleigh bed and sitting area. Guests appreciate our 2-sided fireplace as well as our 2-person whirlpool tub. Enjoy breakfast with views of our gardens, ponds, and mountains through French doors to your own private deck. Guests love our exceptionally large, glass-walled custom-tiled shower. 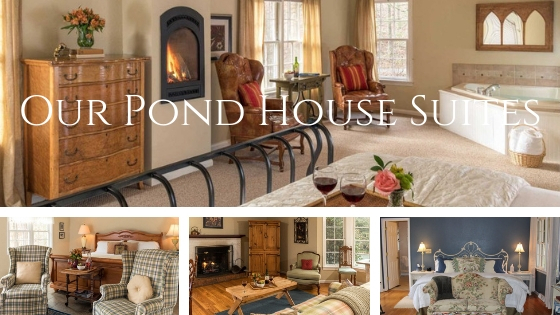 Our other first-floor, pet-friendly accommodations, in the Pond House, is the Cottage Suite. There is a palm-leafed fan above and a jetted tub surrounded by plants. The Cottage Suite also has two separate small sitting areas. 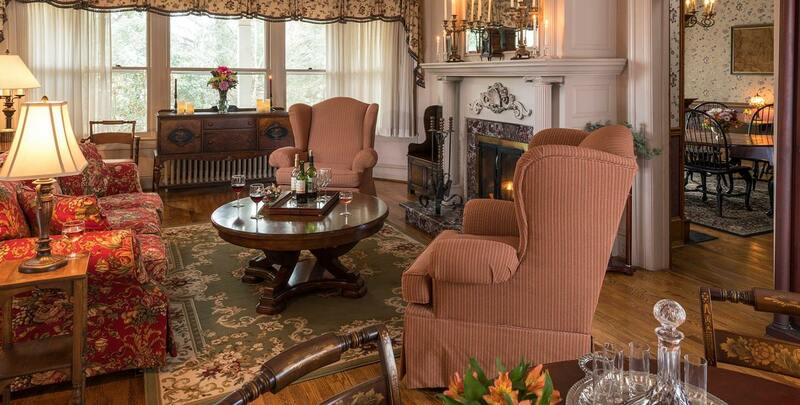 The Cottage Suite features a king-size bed, gas-log fireplace, and private deck overlooking the upper pond. The Sunrise Suite is our only two-story accommodation with several sitting areas and a private tree house deck overlooking our upper pond. The second story has a roomy king-size bed with a private balcony. The ground floor has both a day bed and a pull-out couch. This suite can accommodate up to five people. 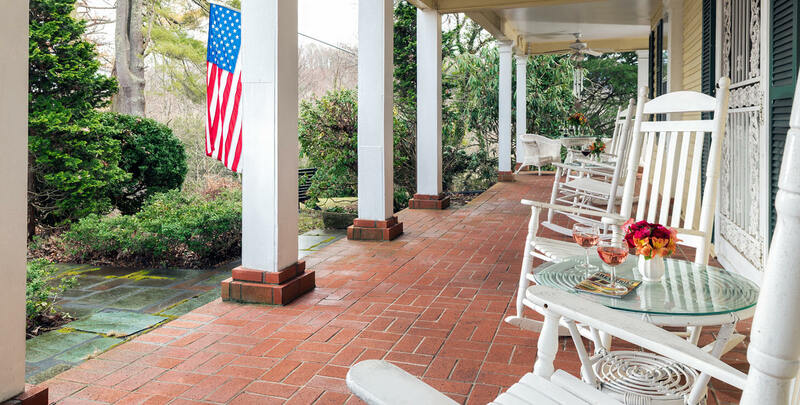 Guests of The Yellow House Bed and Breakfast receive complimentary coffee, tea, soft drinks, and snacks available 24 hours in addition to our complimentary wine & hors d’oeuvres conversation hour every evening. Guests have their own refrigerators, in-room coffee and tea, private baths with amenities, and comfy robes. We offer homemade healthful, or decadent gourmet breakfast served in our dining room (or delivered to your quarters for an additional charge). The Yellow House Bed and Breakfast has been lovingly restored to its former glory with you, the guest, in mind. We have a total of ten rooms each with their own gas fireplace. The satisfaction of our guests is our top priority and we welcome you to take advantage of our concierge services and enhancements to make your stay with us even more memorable and carefree.